Do you have or know someone with a visually impaired child? Continue reading! Jean Williams shares her top tips to look out for when purchasing storybooks for visually impaired children. As the Executive Director of Biblionef, one of our main objectives is that ALL children should have access to books, this includes visually impaired children. Hence, we had previously made provision to assist 20 schools across South Africa working with visually impaired children. It can be a daunting task for parents with visually impaired children to know what books to buy for their child, especially if they do not know what to look out for. 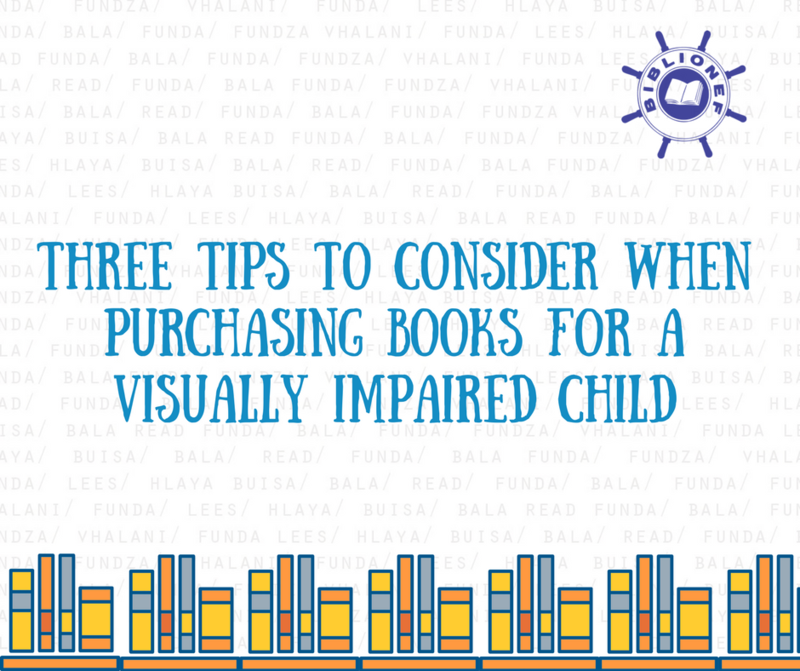 Below are my top three tips to consider when buying books for a child with visual impairment. Depending on the severity of the child’s visual impairment, choose books that are in large/ bold print. Not all the children attending visually impaired schools are blind; some of the children have partial or limited vision and can still read, but require big print books. These books make it easier for the child to read the printed words. Helps teach the young pre-school blind child the concepts of mathematics and support the pre-Braille learning phase. Tactile books come in the form of cloth books or Graphic Tactile books which have raised images that tell a story which can be read by the fingers. The joy of being read to, is so powerful and when you are blind or struggle to read an audio-book is of great help, be it a CD or tape or nowadays an iPod. The listener has access to an expert storyteller who brings the story alive and it has proved to be of great pleasure to children who are blind. Blind children, in particular, get enormous advantages out of having access to audio-books as the number, variety and access to Braille books is still limited. Experts agree that reading aloud is the single most important activity for developing proficient reading skills. The road to becoming a reader begins with hearing stories or reading aloud. I hope that you have found this brief article helpful and that you will consider some of these options the next time you wish to purchase a storybook for a visually impaired child.